No, this isn’t mutton; it’s chicken. But I made this curry dish with some curry paste that is supposed to be for mutton. That sounds ghastly to me, but I can’t really tell the differences among the different packets of curry paste I have. I just pick one and use it. I added chicken broth, Montreal Steak Seasoning, Rapunzel vegetable broth granules, and Mexican oregano to the curry paste, along with sautéed onions, red pepper, carrots, and some of the “magic ingredient” mentioned in a previous post – the tomato pesto. I thickened it with a cornstarch slurry, added the last of the roasted chicken, and served it up over white rice. I’m not all that fond of curry. This was good, but I don’t make it up very strong, so a real curry lover would probably find it weak and not very interesting. I put yogurt on the table in case we thought that might go good with it, but neither of us ate any of it. This entry was posted in Uncategorized and tagged Arizona, Broccoli, Chicken, Curry, Curry Paste, Dinner, Food, Full Plates, Onions, Red Peppers, Sierra Vista, Tomato Pesto, Vegetables. Bookmark the permalink. The colors are gorgeous–I admire the way you put spices together! It must’ve been delicious. 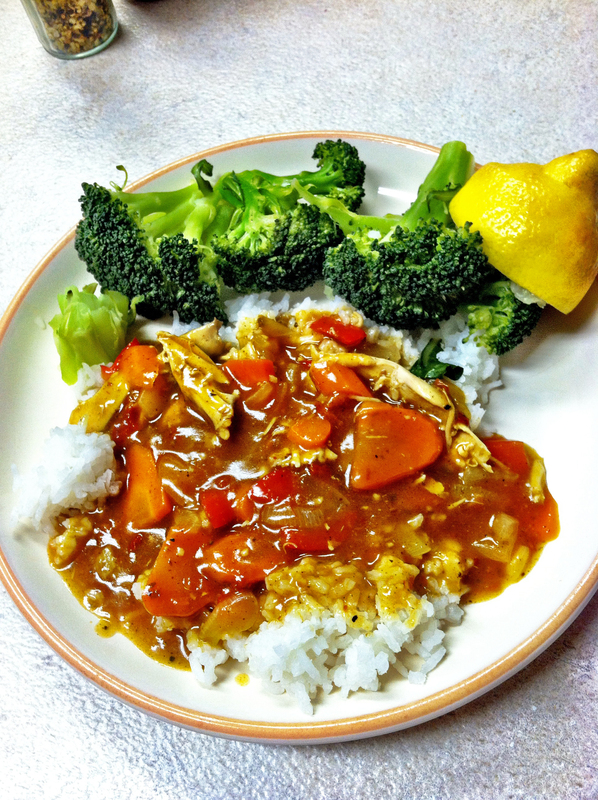 I’m not a big fan of curry, but this came out to be very flavorful, without being so hot! It was. Thank you for stopping by! Looks wonderful. I’m a lover of spice, but food has to be attractive to be eaten & this ticks all the boxes. Thank you for your kind words. (Hit send too soon.). Flavors are definitely enhanced by the eye! The photograph is gorgeous! Hailing originally from India, I agree mutton is the way to go. Try out the curry paste on http://www.bombaybrand.com. Thanks for the pointer. Those products look really good. Thanks! Been doing this for many years and enjoy putting together new products. So this is your product site?